Well, hello! I meant to post this back when I first made it, for my month as Stash Bee Queen in the beginning of February, but late is better than never, right? We finally managed to invest in a laptop over here, so I can now blog from the comfort of my bed instead of having to sit up at the computer! I'm hoping to start catching up on the numerous, numerous things that I've shared bits of on Instagram but haven't gotten around to featuring here on my blog. The block from the tutorial I used was 12" finished (12.5" unfinished), but mine ended up at 11.75" unfinished - I'll explain why at the end, don't worry! First off, decide if you'd like to make your donut scrappy or not! 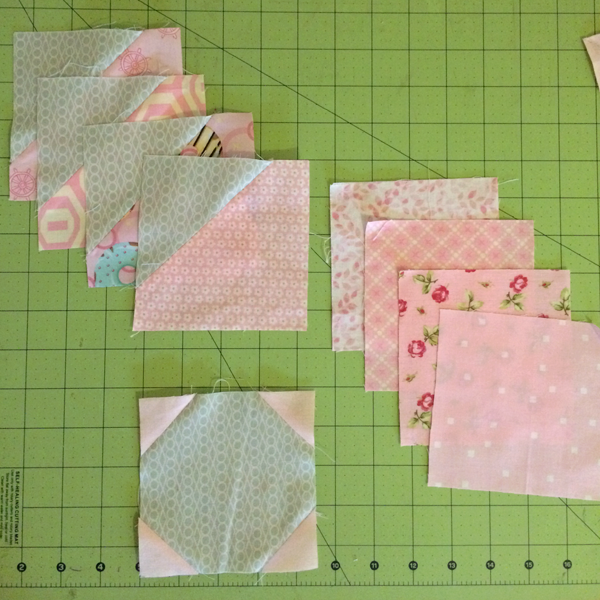 I make everything scrappy (why use one fabric when you can use eight??? 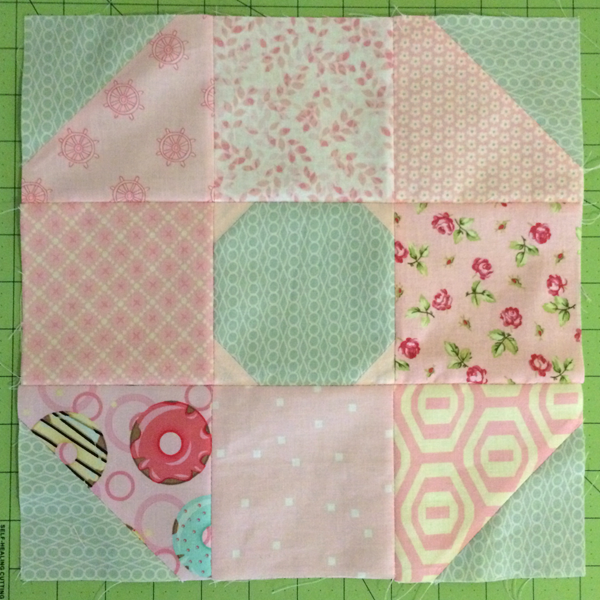 ), so well, I made this scrappy, too :) Either way, you will need (8) 4.5" squares and (4) 1.5" squares for the donut, and (1) 4.5" square and (4) 3.5" squares for the background. 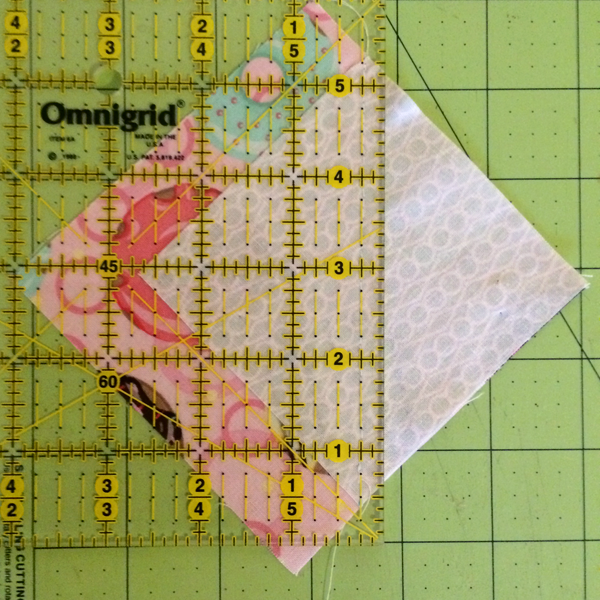 Draw a diagonal line from corner to corner the wrong side of the (4) 1.5" squares and (4) 3.5" squares with a pencil or water soluble pen, then pin as shown. I like pinning them this way because you can sew right down the line without having to stop, plus I find it helps with that crossgrain shifting you get when sewing along diagonals. 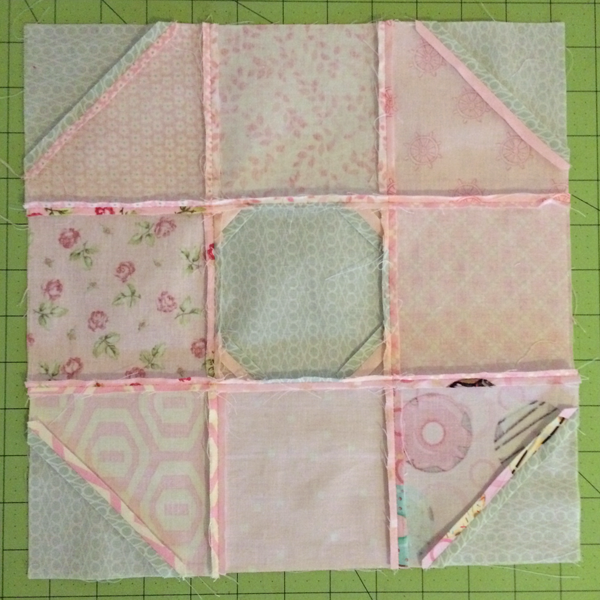 I usually don't pin the tiny squares, they're so small that they're more difficult to pin than to just hold in place! Note: If you're particular about your background being directionally the same, then pin two squares going vertical and two going horizontal - you should end up with them all the right direction! I don't mind either way, personally. Also, I find it helps to use a much smaller stitch length when stitching tiny pieces of fabric...my machine has a big problem with pulling fabric down. 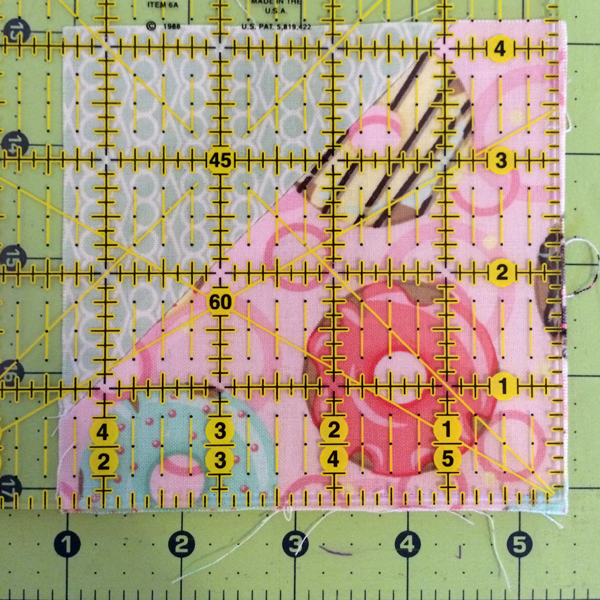 Sew along your marked lines! Afterwards, do a quick check to be sure you've sewn them correctly (for some reason I always end up having to re-do at least one!). On the left, you can see that my sewn line strays a bit outward, while on the right it's perfectly straight. How can you tell if you're off by enough you should re-do it? I just fold back the corners really quick. If it looks like this, you'll probably want to re-do it! If it looks like this, you're good! Hooray! Once you're pretty sure you don't need to sew anything again, trim the corners. 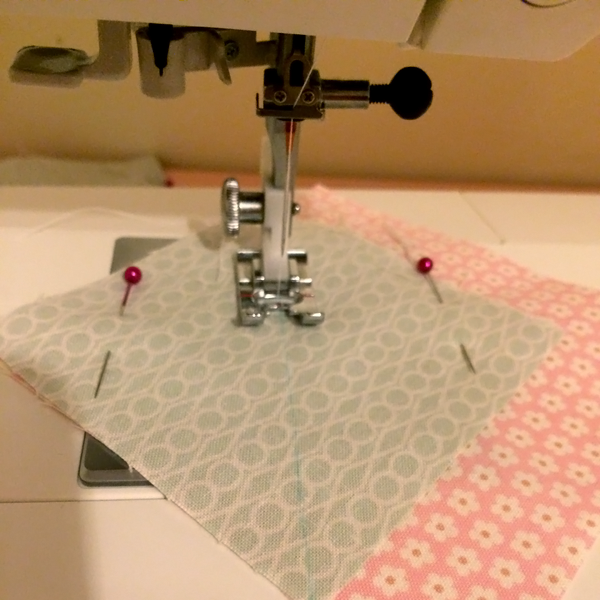 Line up the quarter inch mark on your ruler with the line you just sewed, and cut! 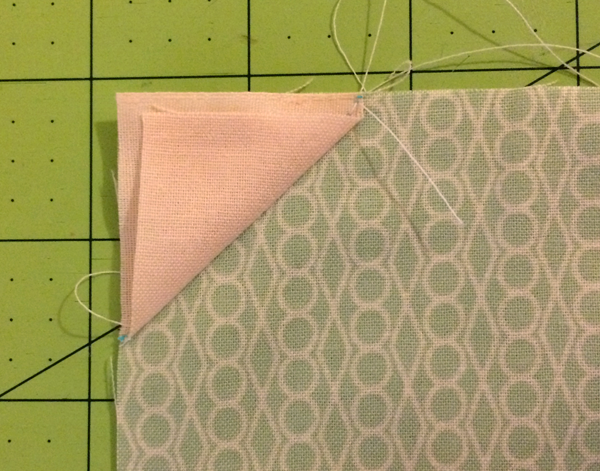 Anyway, do this along each seam you've just sewn, then press your seam allowances. 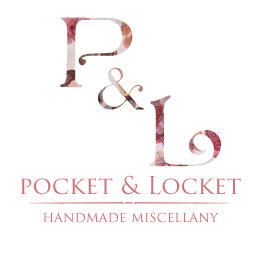 I like to press my seams open (garment industry background never dies), but you can press them however you like! 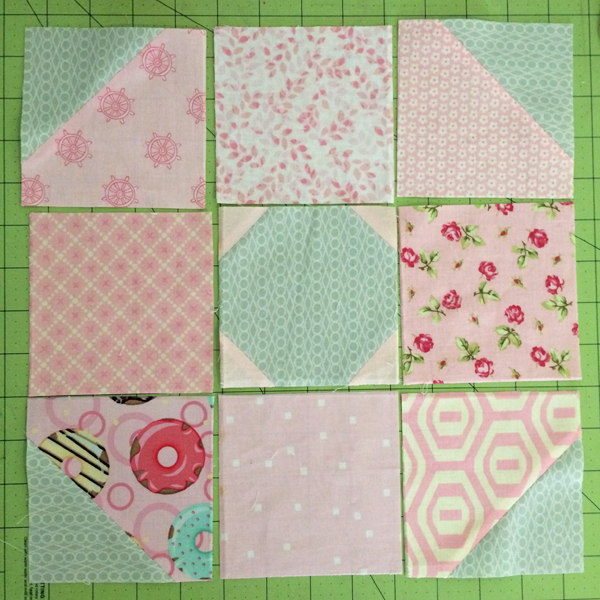 Now, I noticed that when I measured my sewn squares, none of them were quite 4.5" square. I'm not sure if there's a good trick to getting these perfect, but I don't know it yet! 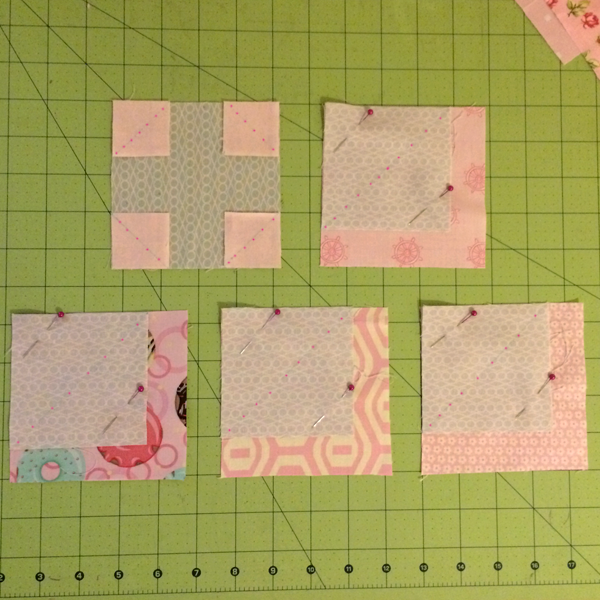 Instead, I trimmed all my squares down to 4.25" square. 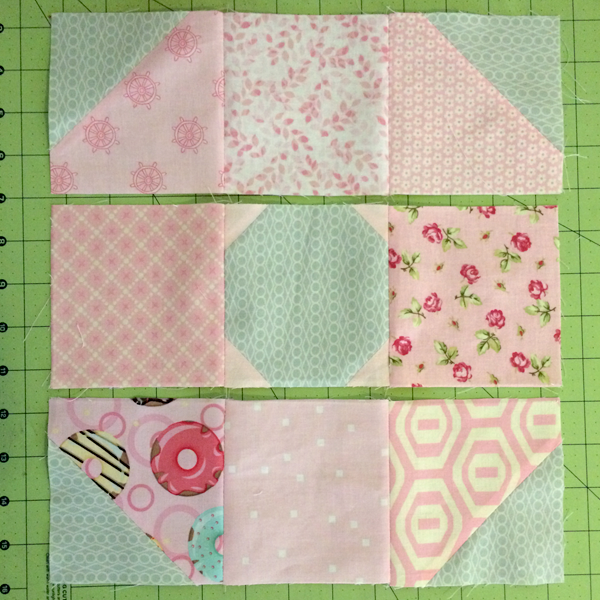 Since this is a sampler quilt and the blocks don't have to be the same size, you have this luxury! 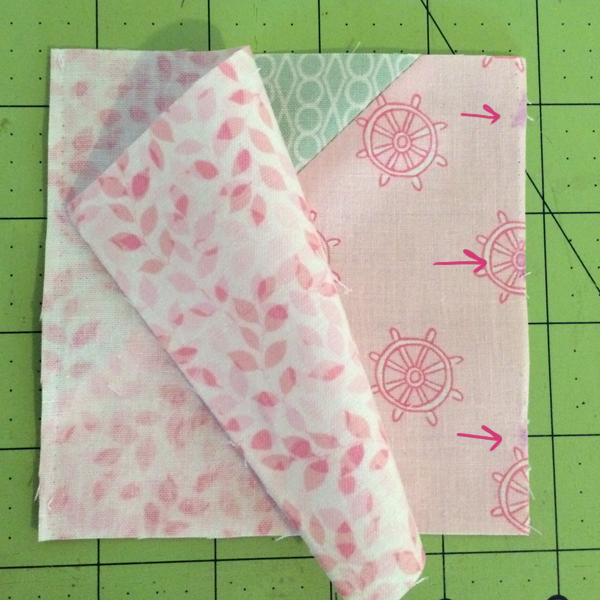 It makes it so, so much easier when you have guaranteed that all the squares you're sewing together are the same size - and makes it much more likely for you to match your seams perfectly when sewing rows together. 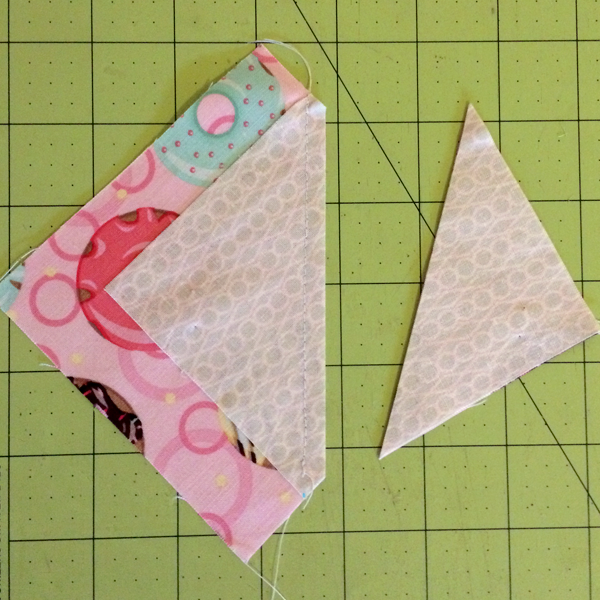 If your blocks are slightly varying sizes, I highly recommend this step! I skip it when I feel lazy/adventurous/like living on the edge, but I almost always end up having to re-do it. 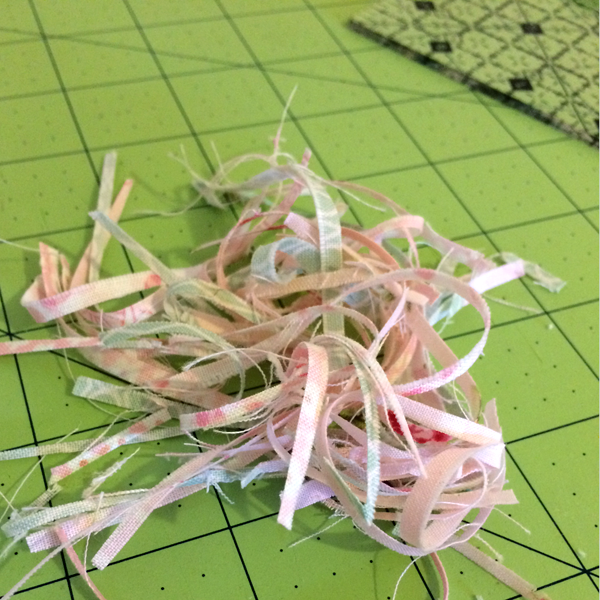 At least I like the little pile of scraps that results! 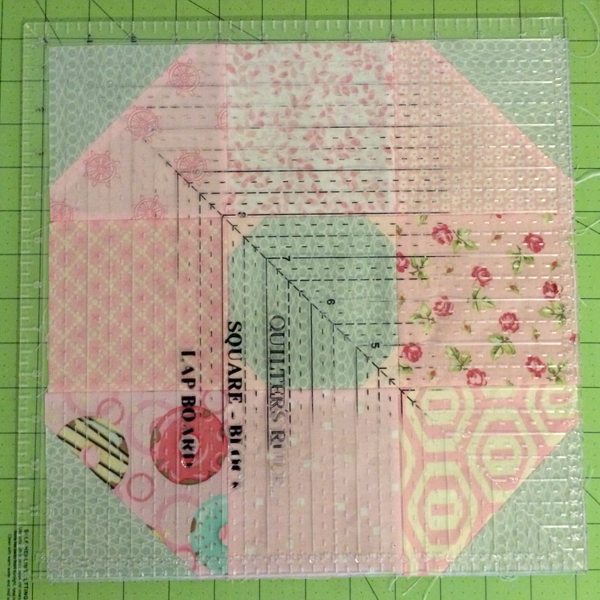 So, if you're awesome and all your squares are 4.5" square (or if you're still awesome, but you ended up with slightly smaller squares), you should be able to lay them out like so! Yayy! It's almost a donut! I mentioned before that I was a glue-baster, and that I used a gluestick specifically. I think it's more common to use liquid glue (with a special tip to avoid getting globs of glue everywhere), but since I am a kindergartner in a lot of ways with craft supplies (you don't want to see me with a pair of scissors), I just don't think it would be a great fit for me! If you don't like/want to baste this way, feel free to use whatever method you're most comfortable with! I'm always astounded with how precise my seams can be when I do this, though. Note: Since writing this I have finally tried to be a grown up and use liquid glue! I liked it, and it was a bit easier to pull apart after the seam was sewn, although before heat setting, the hold seemed a bit more fragile. As long as I was careful, I made a tiny enough dot that I don't think I'd need a tip. It would probably speed things up a lot, though! 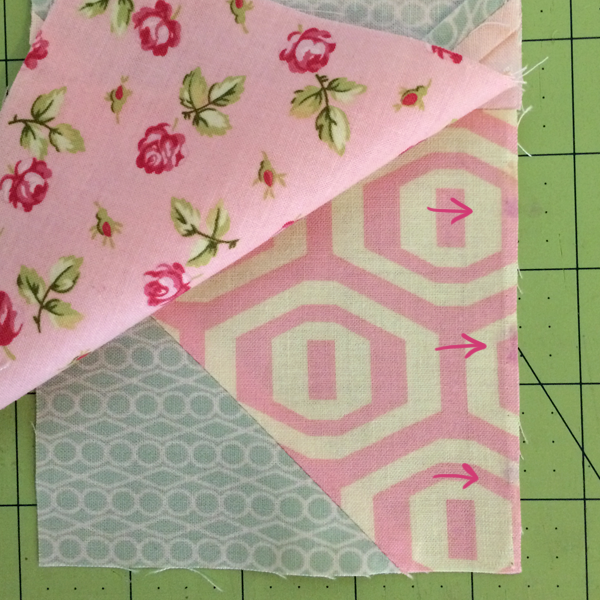 Your next step will be sewing your squares into three rows, then sewing the rows together! Yay! All sewn into rows! Now to glue baste the rows together. This part is slightly trickier since you have seams to align now as well. 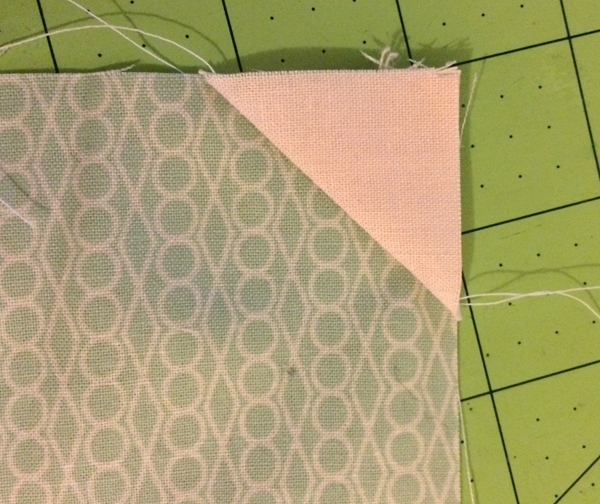 I do the same thing as with the squares, just lining them up right sides facing, this time being sure that the seams are aligned on both sides. I like to start from the center, using the same glue placement; one dab about an inch away from each seam and one in the center. Then do either end, with the same technique. 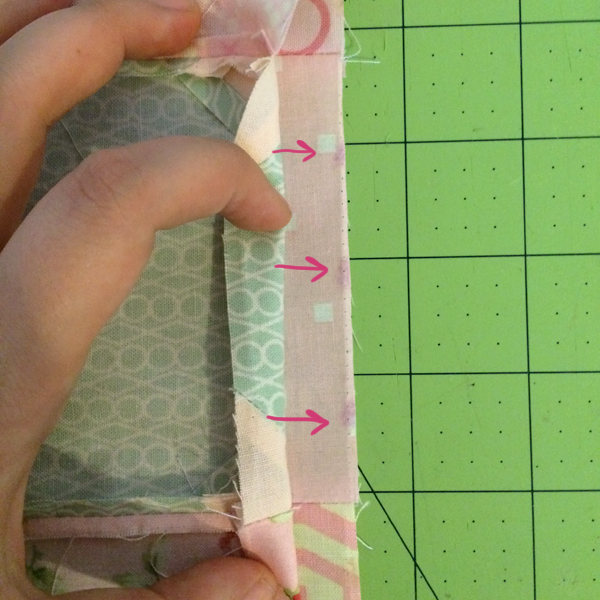 Sew your seams together and then check to see your seam alignment! How'd you do? If you pressed your seams open, this is what the back should look like. I think mine might need more steam, haha! 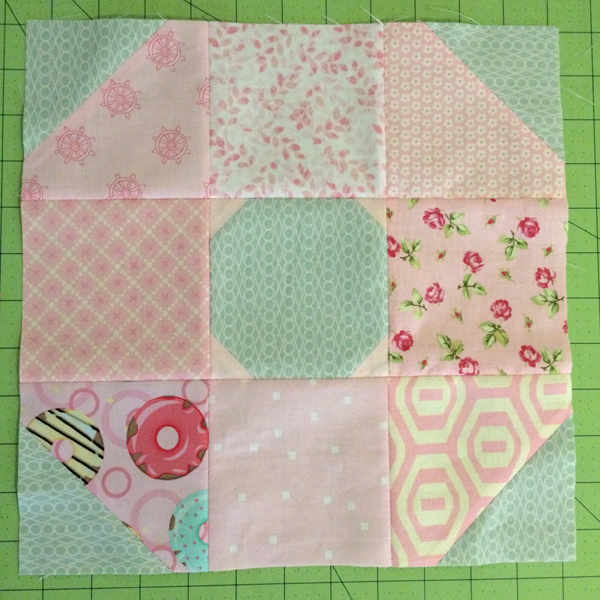 When I measured my block, I noticed it was just between 12" and 11.75" square. Just for the sake of tidying things up, I squared it up to 11.75" square; this, combined with squaring up my 4.5" squares to 4.25" squares, is why my block is 11.75" instead of 12.5"! 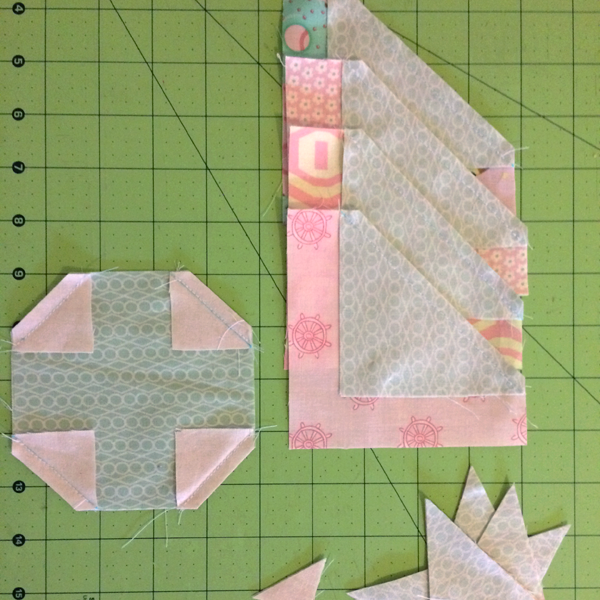 Hey, I ended up with some awesome seams though, so I think it's worth it :) Plus, in a sampler quilt, the size of the individual blocks is pretty negligible! Well, what do you think? Craving donuts now? 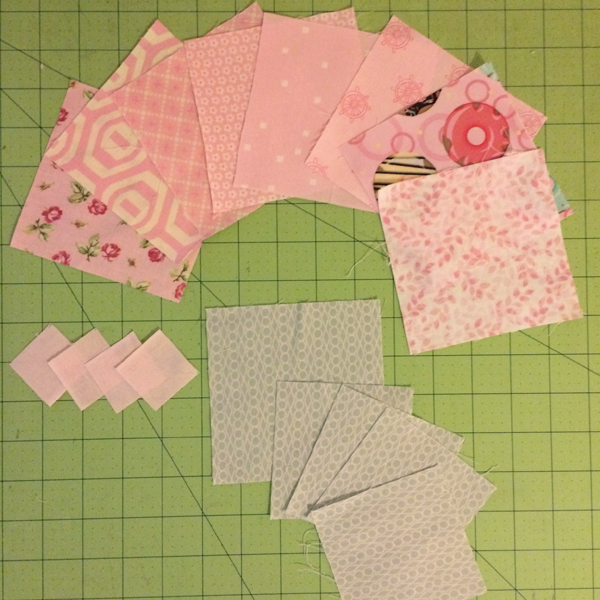 I think I'm in love with making these, I could assembly line them pretty quickly, probably...hmm maybe I'll have to make more as a backing for my bee quilt! Please let me know immediately if you have any questions or concerns or anything! This is my first tutorial, so I'm anxious for it to be helpful and easy to understand. And most of all, inspiring! Please let me know if you end up making some of these ♥♥ I'd love to see more cute donuts out there!